On July 9 at approximately 10:30 a.m. the Calcasieu Parish Sheriff’s Office received a call in reference to a car almost causing a wreck that was traveling westbound on I-10 near mile marker 21. The complainant stated it appeared there were two occupants in the car fighting. The complainant was able to give deputies a description of the car and deputies located it at a local convenience store near the interstate in Vinton. 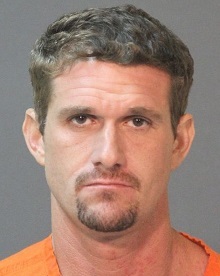 When deputies approached the car they spoke with the driver, Daniel J. Vincent, 36, Lake Charles, and 2 female passengers, who were acquaintances of Vincent. While speaking with them deputies learned that Vincent had forced one of the women into the car, after an argument, against her will by grabbing her by the back of the head and slamming her into the car and using the car door to push her the rest of the way into the car. Deputies also learned that Vincent had left two family members, ages 7 and 10, alone in local hotel, while he attempted to drive the two woman to an unknown location in Texas. After further investigation Vincent, who was also found to be in possession of Alprazolam and Suboxone without a prescription, was arrested and booked into the Calcasieu Correctional Center and charged with simple battery; simple kidnapping; child desertion; possession of CDS II; and possession of CDS IV. Judge David Ritchie set his bond at $226,500. CPSO Detective Bryan Alexander is lead investigator in the case. All those charges were dropped. Only one possession charge stuck. But thanks for keeping up with the case and making me look like a monster. I have custody of the children that were left in the care of an adult. The woman in question was being driven to her mother where she lives today. You don't realize what yall do to someone image just to get ratings. I've lost several jobs because of this lack of facts nonsense.